4th September is when I completed a quarter of a century. I turned 25 and it’s been a rather eventful birthday indeed. 4th being a Sunday, the celebrations started on Saturday itself with my office team organizing a cakeand we had a lunch party too. It didn’t just stop there, on Sunday I spent time cutting two more cakes – Hows that for a birthday? 5 cake cuttings? It’s been a memorable birthday and I am glad it all happened with great joy. Although I put the photos online much earlier I couldn’t get this post to go online earlier – it’s been a crazy start for the week. Two account presentations and one pitch in the pipeline. If it wasn’t for the support of a great team at work we would have ended up working for the entire night. The presentations went smooth and we seemed to have bagged the account, which only means the next two weeks are going to be crazy trying to wrap up all the project deliverables. Today is Ganesh Chaturathi and a HOLIDAY at work. I have been exhausted so practically had to spend the day resting at home. However it gave me some time to get the photos organized and even send out thank you notes for the birthdaywishes. 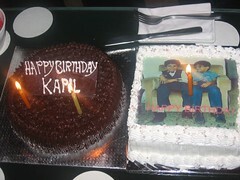 Update: Read more about my birthday cakes at the KhanaPeena Blog.